Apart from his sophisticated public speeches, love for humanity and spotless political and personal reputation – another less known fact that distinguishes Senator Scott Ludlam from other ordinary politicians is that he is a Go player. If you have been to any of the Greens Senator Scott Ludlam’s presentations, titled WA 2.0, outlining a daring and innovative sustainable future for the largest state in Australia, based on renewable energy, humane social policy and adequate infrastructure to fit the new needs of 21st century, you would have undoubtedly noticed that the Greens Senator utilised a chess metaphor at the very start. This metaphor serves as a tool to reveal the destructive nature of the economic model we are trapped in based on doubling of the economy every 15 years and thus the chess board is utilised as the basis of that destruction: seemingly unconnected notions of board games and (un) sustainable futures. However, is that really surprising? Chess has been serving as a metaphor for destruction long in history – a simple analogy is that the game starts with a full board and ends with virtually empty one – but the most interesting fact about chess its success story in the Western World. Indeed, the economic principle of consuming natural resources at unprecedented rate, with associated the wealth privileges for the chosen few has long been the favoured model of development ever since the Industrial revolution. What is left out of the equation, however, is that there is a different model, or alternative ‘game’ that has not made its popularity to the West. 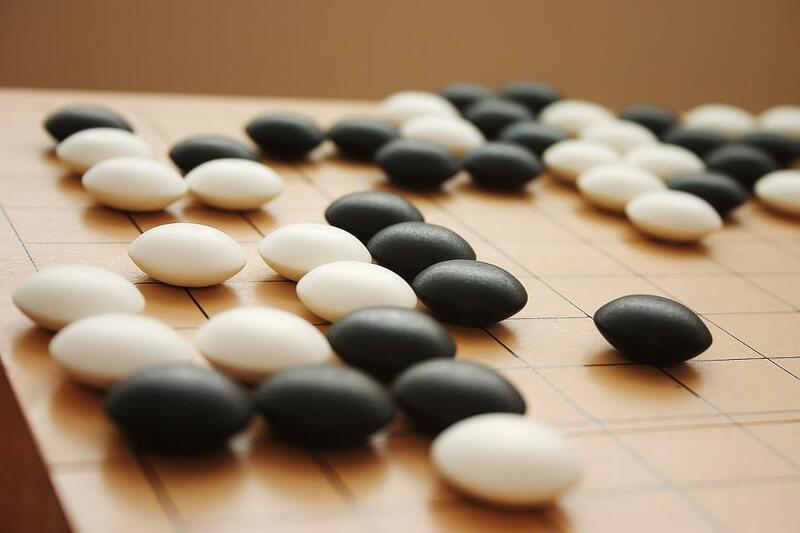 This game, named ‘Go’, is based on the opposite principle – that is a constructivism– you start with an empty 19×19 board and you end up with a board, filed in with black and white stones, depicting a physiological map of both players at the time of play. Go (바둑, Wei-ci) isthe oldest known game in human civilisation, originating in China some 4 000 years ago and it was popularised in the West by the Japanese (Edo era). It is also known in literature as the glass bead game, a name given by Herman Hesse. Because of its highly symbolised nature, reliance of shapes and directions, and because it is based on real social life situations, Go is also known as the ‘game of the universe, ‘a conversation by hands’ and it was originally reserved for emperors and for higher class citizens, until it was democratized in the later periods. Perhaps, one of the most striking difference between Go and other logic games (such as Chess), is that all pieces are of equal values. The strength of a single black or white stone is not pre-determined, but it entirely depends on the timing and the positioning of the stone on the board; unlike chess, where certain pieces are regarded of lesser value, regardless of the time and place of play and making explicit links to cast and class systems. Similarly, all citizens are seen as of equal value, regardless of their status, be that humanitarian, skilled or family entrants to Australia. This includes skilled, semi-skilled and unskilled migrants, refugees, those less unfortunate with disabilities, homeless people as well as directors of corporations, doctors, farmers and so on. So is it surprising that Scott Ludlam shouses the metaphor of chess, and not of Go? Indeed, the board signifies the foremost setting for the anthropology of society because this is where the meeting of cultural politics –discourses, policies, and institutions – are most clearly contested by, or reproduced through, people’s actual meanings, perspectives, and practices. Ability to think strategically, and to recognise that the opponent is not an enemy, but a friend, and best teacher are deeply imbedded in the ethics of Go. Similarly, Senator Scott Ludlam has demonstrated this ability in his wide-angled strategy for the sustainable future of Western Australia, evident in his presentation on WA 2.0, covering aspects from sustainable transport to renewable energy infrastructure, social justice and educational and health. He has also utilised the skills to learn from his opponents, and to thank the elected Prime Minister for the opportunity to bring the best qualities in him and his team from the Greens for a second chance of winning the state federal elections on the 5th April 2014. 1) Sharing resources– it is impossible to win all corners of the board, so ability to share the territory with your opponent is essential. 2) Working together– the stones are strong in groups, and can only survive if they are linked together. 3) Think strategically – think in advance and have a long-term vision; the winner of the game is solely determined by this quality. The Go board has become a political reality, requiring an attempt to authorize more deconstructed notions to reckon with considerable institutional inertia. One more fact to support this claim is that there a human being is currently a stronger player than any software. We have much to learn comparatively because the Go board represent very different contexts, scales, and processes with regards to society. It is something, called a “common sense”, which is too often missing from reasoning behind some of the most controversial policies in Western Australia, such as the shark cull, the freedom of internet and the outsourcing of refugee’s responsibilities to Papua New Guinea. With its slash of the Abbott government in his recent address in the Senate, welcoming the Prime Minister to Western Australia, with his consistent effort to break the stigma of the negative image, penetrating the West Australian state as a ‘mining’ state. The central place of the board is called a star point and because of its high level of influence, is also associated with a great deal of risk and a need of skills; it is generally first claimed by the most ambitious player, but only those with the longest –term vision are able to defend its position and ultimately to claim victory. Finally, winning has been traditionally of secondary concern to Go players. There have been often two winners – one is the official winner, and one is the quality winner. Perhaps this is one more reason to which Scott Ludlam’s success can be attributed. It is well known that most Go players share above the average success in life. It is also a well-known fact, that Go players need to hold certain moral values, which cannot be found in others – and that is playing a quality games comes before winning. This is why regardless of the formal outcomes of the new State Senate elections the winner is being determined not by numbers, but by quality. The battle for the star point is on at the 5th April historical by-senate federal elections in Western Australia. The biggest difference now is that everybody is a part of the game.